I don’t get the chance to have Spa Day very often, but thanks to the recent Christmas and birthday gifts from my in-laws, I was able to go today for the works – a 50 minute massage and 50 minute facial. Heaven. When I was on my stomach, she worked her way straight down either side of my spine – from the neck to the waist – and I jumped out of my skin. Apparently, when muscles are tight, and you apply just the right amount of pressure, it can create seriously ticklish spots. When I jumped, the masseuse jumped, and I could tell she was wondering if she should try it again or just skip it. I wasn’t going to give her any clues. Hey, she’s a professional, I can’t be the first person to respond like “Surprised Kitten” to her ministrations. Yes. Surprised Kitten. I assume you’ve seen the cute little ticklish kitten video. If not, please refer to this link and witness what was taking place on the massage table. I swear, in my head, that’s totally how I responded every time she touched my back. Eventually, we got past this awkward little dance and on to actual relaxation, during which I started thinking about my very first massage experience. I was probably 23 or so and went to South Padre Island with a friend. My mother recommended a masseuse and offered to pay, so I, of course, accepted and scheduled an appointment. “Oh?” I responded, trying to feign interest. I cannot believe I ever tried massage again. The human spirit is indeed resilient. Meanwhile, back to the actual GOOD massage. After the ticklishness/jumpiness passed, all went well. In my semi-comatose state, I was directed back to the lounge to await the facial person. Facialista? Facial therapist? Aesthetician? I have to say that she was as nice as could be when she told me my face needed a little extra exfoliation – for a little extra money. It’s always amusing to me when they ask how long ago your last facial was. I told her probably some time in the past year. “Oh, why? You don’t think about it? You forget?” Yes. I tend to forget about my face as often as I can. Maybe they are, but I prefer to go in offering people a real challenge. It takes a lot of time and work to get these knots in my shoulders and dry, non-exfoliated skin on my face and neck. These spa days cost a lot of money, and I see no reason to make it easy for them. They DID remind me that Mother’s Day is coming up – so maybe they’ll get another shot at me before too long. In the meantime, I’m going to go enjoy my jello-like state. And maybe make some biscuits and gravy with a stick of fried butter on the side. 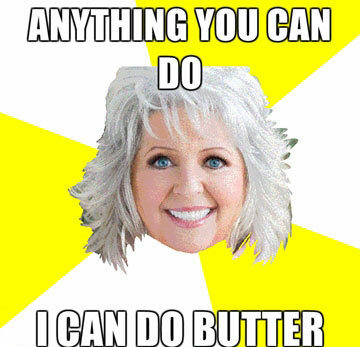 Damn you, Paula Deen. You and Surprised Kitten have annihilated my hoity-toity day. I already want to see closed captioning! I’ve never seen it. You were brave to go for the spa day after your previous experience. Not sure whether I would fancy it, or run a mile… actually running a mile would be healthy, too!